Snapdeal is one of the biggest online shopping network across India. As compared to Flipkart, snapdeal always offer products at lower prices. To target mobile app users and maximize profit, snapdeal is now looking for “refer and earn” program. Using this referral program, you can earn unlimited sd cash! Let us take a closer look at this awesome deal. Snapdeal is offering Snapdeal free credits on downloading its official app on your mobile. Not even this on referring your friends through Snapdeal Invite Code, you will get credits again in your account. You can earn the maximum of 500 SD cash in your account and offer valid only for first time download can get this offer . Login or signup to your account snapdeal account . You will get Rs 50 free SD cash and 50 per referral . Snapdeal Cash in your account will expire in 30 days . 1. To get Rs 50, user should be new on snapdeal and should be installing snapdeal app for first time not installing and then reinstalling the app. Mobile number should be new. 3. The SD Cash earned through program will have a validity of 30 days. So make sure you use it within 30 days. 5. Offer only for android and windows phone users. 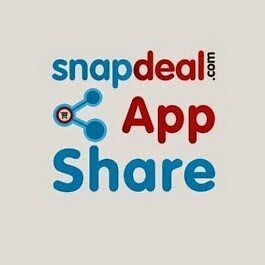 What is Snapdeal AppShare & Snapdeal Invite Code ? Snapdeal AppShare is the easiest way to share your favourite app with your friends and family. By sharing the app, you also earn money which can be used to shop on Snapdeal Shopping App. To start off, you need to download the Snapdeal app / upgrade your existing Snapdeal app. Next, invite your friends & family to download the app by sharing a simple invite code with them. For every person who downloads the Snapdeal app through your invite, you earn Rs. 50 while your friend earns Rs. 50. Sharing and Savings, both are now in your hands! What is snapdeal invite code? It is a special code shared by your friend to invite you to join Snapdeal app users community. Use this code when using the Snapdeal app for the first time to earn monetary reward. You can invite anyone whom you want to gift Rs. 50 along with the power to save money while shopping on Snapdeal App. In the process, you also earn Rs. 50 for every successful installation through your app share invite. However, the Rs. 50 reward is available only when the person installing the Snapdeal app for the first time and hence is a new Snapdeal app user. Inviting friends is as simple as sharing a link. Just go to the Snapdeal AppShare section of your favourite Snapdeal App. Sign up or sign in and select from many available options to share – Facebook / WhatsApp / SMS / Email / Others. Click on any of the options and just follow the process. Voila! You have just invited your friends to the world of Savings through Snapdeal App. Who is eligible for invite reward? Anyone who has a smartphone (Android, iOS or Windows) and a mobile number can earn invite reward. Mobile number is used for one-time validation using standard One Time Password method. How to earn invite reward? Install the Snapdeal app and simply apply the invite code shared by your friend in the invite message while signing up. Next, verify your mobile number using the one time password and sign up/sign in. Your account is immediately credited with SD cash Rs. 50. However, please note that the invite reward is available only to first time Snapdeal App users. How do I use the invite reward? Your reward is stored in the SD cash section of your account. Whenever you are making a purchase on Snapdeal using the app, just enter the amount of SD cash that you want to spend, and the same will be deducted from the final purchase amount. Will my invite reward cash be there forever? I was invited but did not get reward. Why? You are installing the Snapdeal app on your smartphone for the first time. Your mobile number has not been used to order on snapdeal app or for claiming invite reward earlier. I have fulfilled all the three conditions above still I am not eligible for reward. Why? System does not allow invitee and invited email Ids to be same, this will make user ineligible for reward. I had invited my friends to download but I did not get the reward even after their download. Why? You will receive your invite reward when the following conditions are met: Your invited friend has installed Snapdeal app on his / her smartphone for the first time. Your friend’s mobile number has not been used to order on Snapdeal app or for claiming invite reward earlier. Your friend is using his / her sign-in for the first time to claim invite reward. I had invited so many friends to download but I did not get the reward for all of them. Why? How will my friend, whose referral code I used for signup, earn SD Cash? Once you download and signup using your friend’s referral code, you immediately get invite reward and the same happens for your friend as well. My friend, who is an iphone user, is unable to get the invite reward. Why? We have currently launched the Snapdeal Appshare program only for Android and Windows’ handsets. We will soon introduce the same for IOS as well. Keep watching this space for updates. Is there a Snapdeal AppShare program on the web? We don’t have a Snapdeal Appshare program on the Web. Hence, you won’t be able to refer any new friends from the Web. AppShare is exclusive for App, so start sharing. . I had referred my friend from app. Can he sign up on web using my new referral code? I had SD cash in my account, but now my account shows zero balance. Why? Snapdeal reserves the right to freeze your SD Cash account if any misuse is observed from your end. So, refer carefully and enjoy the benefits! !